When did you last walk barefoot on the beach or on green grass? Can you recall the feeling sensation of warmth or wellbeing? That’s the earth’s subtle, natural energy flowing up through the soles of your feet. Earthing is being in conductive contact with the earth. It’s is a surprisingly powerful way to reduce pain and inflammation, sleep better, improve circulation and normalise blood pressure. 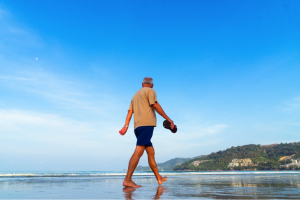 The health benefits of earthing can be far-reaching. That’s because earthing supports your body’s ability to heal itself. It enhances immune response, reduces inflammation and speeds recovery from injury. Why Try Earthing or Grounding? There is a 20-year body of research on Earthing including 15 studies and 3 review articles in peer-reviewed journals. Many of these studies are double-blind and use objective tests to measure the participant’s physiological response to earthing indoors using an earthing mat, electrode patches, or earthing bedding that is connected to the earth. Simply go outside and kick off your shoes. Take a barefoot walk on grass or unpainted concrete. Take note of how you feel before and after. As little as 30-minutes may be enough to notice a difference in muscle fatigue, pain, stress or mood. Astonishingly, earthing has always been around, and yet we’ve overlooked it. Many ancient peoples believe in the healing power of the earth – including Egyptian, Greek, Indigenous Australian, Indian and Native American Indians. In the 19th century, German physiotherapist and naturalist Sebastian Kneipp argued that walking barefoot could help avoid disease. 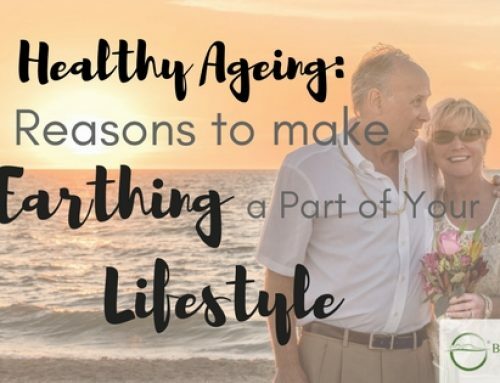 More recently scientists have investigated the health benefits of connecting your body to the earth. Connecting to Earth helps us top up on energy and rebalance our body’s systems, which by nature bioelectrical. The Earth’s surface has a subtle, negative electrical charge due to lightning strikes and atmospheric pressure. On an atomic level, it is full of free electrons – the smallest unit of negative charge. 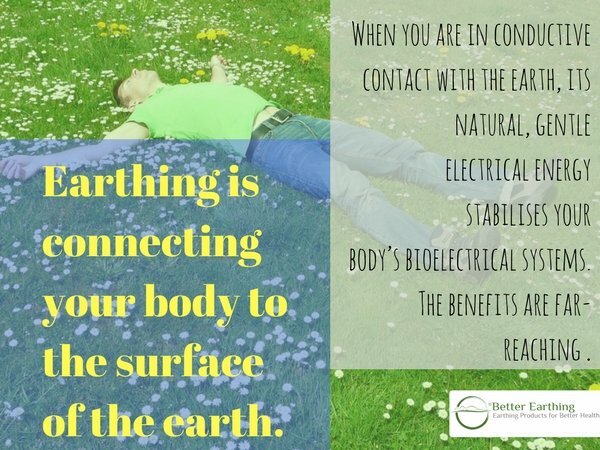 Earthing can help keep our body’s bioelectrical systems functioning smoothly. We rarely think of our bodies as being electrical, but they are. Your heartbeat and your nervous system rely on electrical impulses. Our heartbeat starts as an impulse or electrical signal in specialised cells called the SA node. This electrical impulse spreads along the walls of the atrium, causing it to contract and let blood into the chamber of the heart. This is just one of many bioelectrical processes that are happening in your body right now. Just by reading this the nerve endings in your eyes are sending electrical signals to your brain. All the while, your lungs are breathing, your heart is beating and your food is digesting! Earthing is grounding your body to the surface of the earth. 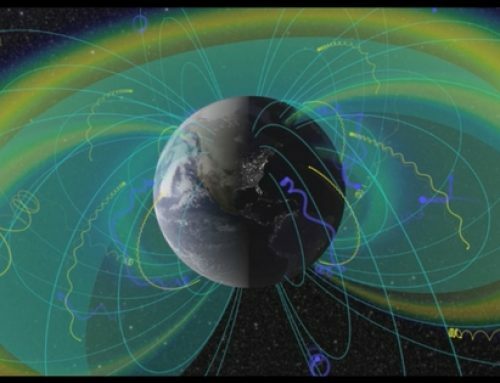 When you are in conductive contact with the earth, its natural, gentle electrical energy stabilises your body’s bioelectrical systems. You have likely heard of free radicals in relation to disease or toxins in our environment or disease. Actually, all your body’s normal processes – breathing, pumping blood around your body, digesting – create free radicals. That’s why free radicals have been linked to ageing. Negative energy from the earth (in the form of free electrons) may counter the accumulation of free radicals in our body according to a report in the Journal of Environmental and Public Health. 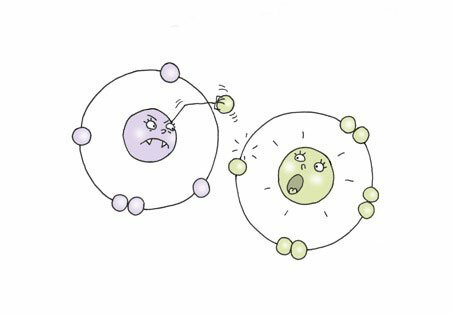 Free radicals lack an electron and are on a constant lookout for free electrons to nullify their positive charge. 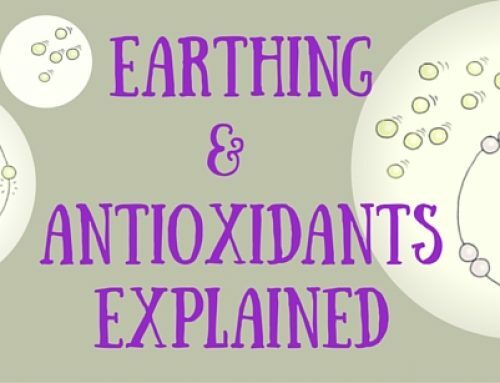 Read more in our article on earthing and antioxidants explained. Sadly, your body cannot eliminate all the free radicals by itself. You can help it out with by eating antioxidant foods like blueberries or by taking supplements like Vitamin E. However, it is hard to keep up with the rapid production of free radicals inside your body. 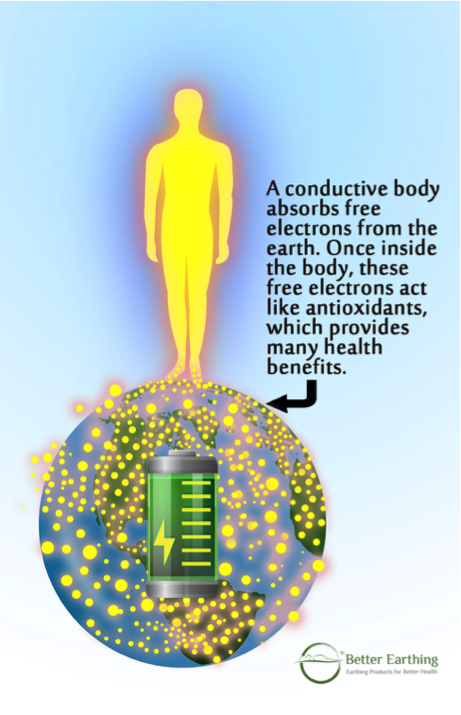 When your body is in conductive contact with earth, excess positive free radicals are neutralised by negatively charged free electrons. Postive + negative = neutral. This gently stabilises your body’s systems. Almost all modern diseases now linked to inflammation, Arthritis, Alzheimer’s, Asthama, Cardiovascular Disease, Cancer, Diabetes, Dementia, Depression, Eczema and more. So it is more important than ever to adopt a heathly lifestyle that minimizes inflammation. Planet earth is a huge natural, anti-inflammatory. Being in contact with the earth may be as important as sunshine or clean air for our health. Earthing is not a fad nor a magic remedy. It is not a medicine or a supplement that you have to remember to take or swallow every day for months before you notice any effect. It does not require long clinic visits or treatments. 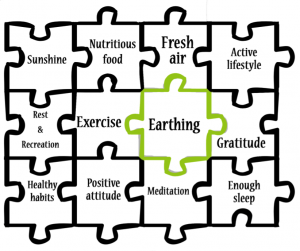 Earthing is a safe and healthy lifestyle practice that can have a transformative effect on your health. If you have a medical condition and are on blood-thinning medication, consult with your doctor before starting earthing regularly. earthing is a natural blood thinner and it may be necessary to reduce your medication dosage. Our earliest ancestors were grounded as they walked, sat, and slept. They walked barefoot, slept on animal hides, and made use of natural conductive materials like leather, clay, metal, animal skins and stone. Our modern lifestyle has taken us away from the earth. Today we live in high-rise buildings, wear rubber-soled shoes (instead of leather) and surrounded by insulating materials such as plastics, synthetics, tar, asphalt that disconnect us from the earth. We deprived ourselves of the free electrons in the earth’s natural electric field, the nourishment that is right beneath our feet. More and more we are exposed to EMF radiation from wifi, mobile phones, household appliances, electrical substations and more. Researchers have repeatedly linked the rise in diseases in recent years to environmental factors. Could our disconnect from the earth be the cause? 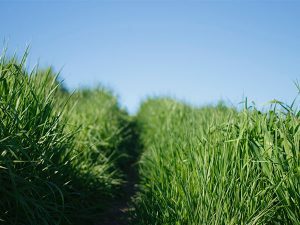 The easiest way to experience earthing outdoors is to simply kick off your shoes and walk barefoot on green grass or moist sand at the beach – moist ground is more conductive than dry sand or dry dirt. In fact, the beach is one of the best places for earthing as the combination of sand and salt water is highly conductive. Ceramic tiles, unpainted concrete and brick (when laid directly on the earth) are also conductive surfaces that allow the human body to ground effectively. Research on earthing suggests that your body experiences changes within four seconds of grounding. Tense muscles relax and the nervous system calms down. After thirty minutes to two hours, you can feel less stress and pain, and experience more warmth in your hands and feet caused by better blood circulation. 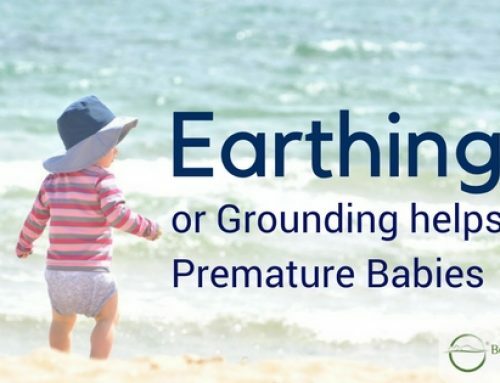 Earthing indoors is connecting your body to the Earth whilst inside of a building (either at home or at the office) using an especially designed product. It is just as effective as earthing barefoot outdoors. Indoor earthing products allow for more hours earthing each day, such as eight hours overnight as you sleep or seven hours work in the office. They are especially convenient during cooler months when the weather is too cool for walking barefoot outdoors. You can choose products for your bed, sofa or office. How Do Indoor Earthing Products Work? Indoor earthing products are made of conductive materials that help pass free electrons from the earth to you. You can connect them to the ground outside in one of two main ways. 1/ You can use a grounding rod or metal stake planted in the dirt outside. We supply a 15metre UV resistant outdoor lead with our grounding rod kits. You can use a splitter to connect multiple products to a single rod. However, this may not be convenient if you live in an apartment or multi-storey home. 2/ An easier option is to connect your earthing product to the third ‘earth’ port of your powerpoint with our specially designed lead and earthing adapter. It conducts earth, not electricity. It allows free electrons from the earth to flow right up through the grounding wire into your earthing product. Here are two of the most common questions people ask about earthing indoors. Is it safe to ground myself via the powerpoint? Yes, it is but only if you are using an especially designed earthing adapter. Better Earthing adapters have two plastic prongs at the top so no electrical current can pass through. Only the third ‘earth’ pin is metal to allow free electrons to pass through. Better Earthing adapter and leads have built-in safety resistors totalling 60,000 ohms, which means barely a mosquito bite of electricity could pass through, even in the event of a power surge. When grounding via a powerpoint, does the power need to be switched on? No, earthing products work perfectly with the powerpoint turned off. That’s because they only conduct free electrons from the earth. However, you can have the powerpoint switched on if you wish to share the socket with an electrical appliance. You can even use a double adapter or powerboard. You may have heard of grounding in relation to electricity, where it is a safety mechanism. In Australia and New Zealand, all buildings including grounding by law. Every powerpoint has three wires — one positive, one neutral (on the top two ports) and one for grounding (third port). The positive wire is where the electricity flows to the breaker and to the transmission pole and transformer. The neutral wire is where electric current will flow to the metal bar in the breaker panel and then to the same transmission pole and transformer. No electricity flows through the ground wire. The ground wire is connected to the ground bar in the breaker panel, which is also connected to a neutral bar and wired to a ground rod outside. In the case of an electrical surge or wiring fault, the excess electrical current goes immediately to the circuit breaker and then gets sent back to the earth. It is not possible for that excess current to go up the grounding port of the powerpoint. In the theoretical event of a power surge came up the earth wiring, the built-in safety resistors (totalling 60,000 ohms) in the Better Earthing Adapter and Lead would prevent it from coming into your product. Barely a mosquito bite of electricity could pass through. You can rest easy knowing that these products are safe to use. How to Know if Your Indoor Earthing Products are Earthed or Grounded Properly? The best way to test if you are properly grounded is to use a multimeter. This will measure your body voltage and determine how much electric current is being induced on you while sitting or standing, and how much electric charge that earthing decreases. Better Earthing multimeters come with a custom extension lead that fits into our earthing adapter. To use the device, set up the multimeter by plugging the green lead into the meter’s middle socket called COM. Plug the black lead into the VQmA socket. Plug the other end of the green lead into the earthing adapter. Turn the dial on to V~ to measure the AC current in your body. Grab the metal end of the black lead, making sure that the metal is in direct with the skin. Take note of the voltage reading while unearthed. While still holding the metal end of the meter, touch your earthing product and you will see the voltage reading drop. The decrease in number in the body voltage meter confirms that the earthing product is working and free electrons are coming into your body. Watch Peter, Better Earthing founder and owner, doing a multimeter test here. Does Earthing Indoors Increase your Exposure to EMFs or Dirty Electricity? One of the most concerns people have about using earthing products is that it may increase our exposure to EMFs or dirty electricity. 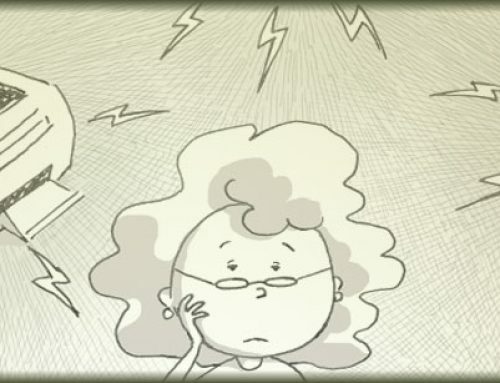 Short for electromagnetic fields, EMFs are energy areas around electronic devices, wiring, powerlines, mobile phones, solar transducers and more. The World Health Organization (WHO) states that EMFs affect human bodies because of the bioelectrical systems inside of that keep the heart, brain and other organs in the body functioning. Excessive exposure to EMFs can cause symptoms to appear, such as fatigue, sleep disturbances, pains, depression, and even cellular damage. One way to protect yourself from this toxic onslaught is Earthing. Research shows that earthing shields the body from low-frequency A/C electrical EMFs, such as your air conditioner, fridge, hair dryer, computer and more. When a person is earthing, levels of A/C electrical EMFs in homes are too low to produce negative effects on the human body according to recent study published in The Journal of Alternative and Complementary Medicine. But far, the most important benefit of earthing is that it supports your body’s innate healing systems so you can thrive in our increasingly urban and EMF dense world. All of the research studies on earthing over the past 20-years have been done in urban environments where the participants were surrounding by EMFs. This includes the medical testing equipment that was not only in the environment but directly placed on the subject – for example the electrode patches used in ECG monitoring. And yet, as Dr Laura Koniver has recently argued, in these EMF laden research environments, these participants experienced better blood circulation, less pain, improved mood, reduced muscle tension. In time, hormones can rebalance, blood sugars stabilises, and quality of sleep improves. These experiences have been echoed in the countless reviews and testimonials from people living in suburban, rural and city environments around the globe. Earthing your body is a smart practice and could help give you an edge on healing. Making earthing part of your daily routine is easy. If you enjoy walking outdoors, just skip the footwear and go barefoot. Or choose the convenience of an indoor earthing product that you can use at your desk, or on your sofa or in bed. With an indoor product, you can ground yourself while working, relaxing or sleeping. There is nothing to remember – no regime to follow, supplements to take or appointments to keep. Earthing products come in many sizes and materials. So there’s one to fit most needs and budgets. Please contact our friendly team to discuss what products are right for you. Having the earth’s healing energy as part of your daily life can help with a raft of health problems (whether serious or mild). The more you do it, the more benefits you are likely to feel. Try it for yourself and see if Mother Earth boosts your health and wellbeing.